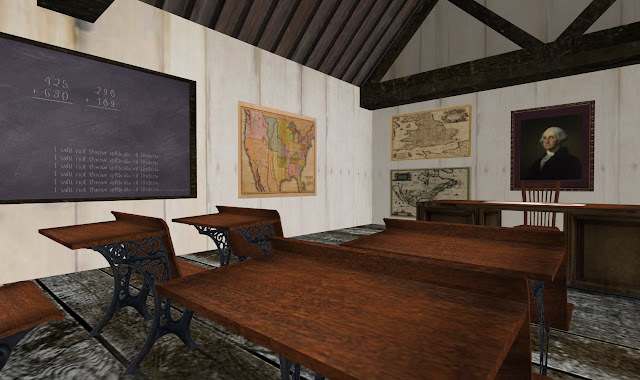 A bit less than two years ago, I posted the Seconderth entry on Oak Grove, one of the sims added when Second Life went from private to public beta (April, 2003). 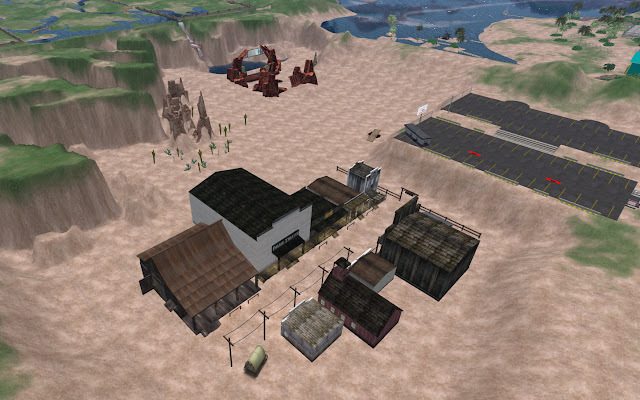 At seven years old, it still had three builds on it: Busy Ben’s Vehicle Lot, Red Rocks Stage, and Wild West Town. The last, however, had suffered severely from prim evaporation, such that the original Saloon was down to a few dozen random prims, and two or three other buildings were completely gone. In the comments to that entry, Marianne McCann clued me in to a couple of Mole Islands where both Oak Grove and Rizal were being reconstructed for eventual transport to their places on the main grid. A year later, Rizal was the first of the two to reappear. Turns out, it wasn’t so much a reconstruction as a renovation incorporating some saved elements, but much more visually and spatially interesting than the original. 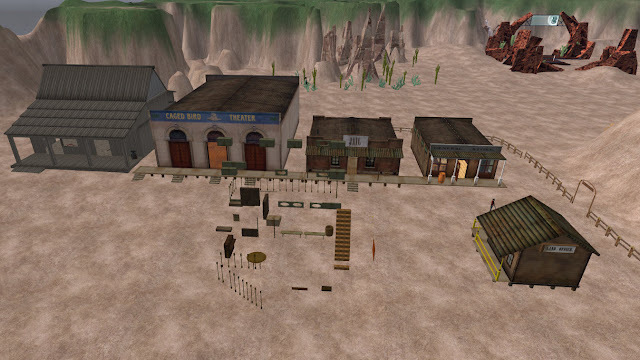 Wild West Town didn’t fare quite so well… and now, despite my respect for the LPDW (in “another Second Life”, I want to be one), I’m in the awkward position of reviewing their work and finding it wanting. – Three completely new buildings not in the original town plan were added. No, my complaint is that it’s lazy work. Floorboard textures are out of proportion; anachronisms appear everywhere; prims were skimped when they needn’t have been… and everything is dark, dark, dark. Even at a midday sun setting, the inside of the Saloon is no easier to see than at the midnight setting. Maybe because they’re moles, and that’s their natural environment? By the way, if you go check it out, turn your draw down to 96m or so – especially when facing west: Nexus Prime is right next door in Gibson.